Born in 1976 in Almaty, education – higher. In 1997 he graduated from Kazakh State Academy of Management, “Finance and Loan” TSC, major: Economist. His labor activity started from the position of Manager in “Akzhol” LLP, where he worked within 1995-1999. Within 2000-2007 held various positions in public and private organizations. Within July 2007 – August 2008 worked as Director of Corporate Management Department in “National Holding “KazAgro” JSC. Since August 2008 held the position of Deputy CEO of “KazAgroGarant” JSC. In 2009 worked in “Rezerv” RPE of the State Material Reserves Committee of the Ministry of Emergency Situations of RK as Deputy Director General. Within 2011-2014 held the position of Deputy Chairman of the Agency for Statistics of RK. 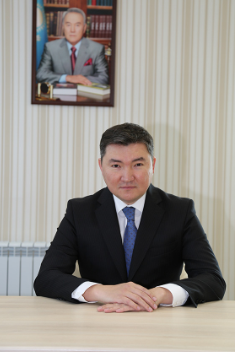 Within August 2014-December 2015 held the position of Deputy Chairman of the Committee on Statistics of the Ministry of National Economy of the Republic of Kazakhstan. State rewards: Anniversary medal “20 years of Independence of the Republic of Kazakhstan” – 10.11.2011, lapel badge “Honor of Statistics” – 08.11.2012, anniversary medal “20 years of the Constitution of the Republic of Kazakhstan” – 05.08.2015, medal “For labor excellence” – 03.12.2015.